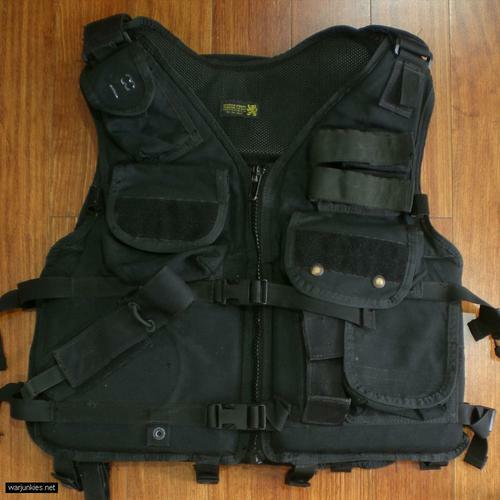 The London Bridge Trading LBT 1620 PFD FLOAT is a Tactical Flotation vest of US Navy SEAL and Navy Boat Units. Also used by Navy Security Units and Coast Guards. Features: front zipper closure, build-in floatation foam, multiple pouches, and build-in pistol holster. U.S. Coast Guard Approval Number 160.064 / 4407 / 0 (Restricted Use Tactical PFD), UL tested and USCG approved using full AEL load-out. Simple and quick to put on, reasonably comfortable, lightweight (3 kg. ), one size fits all. Hardware and closed cell foam is UL and USCG approved. Front-entry using #10 molded plastic zipper with plastic slider. Two additional straps (1\" webbing with side release buckles) for increased security. Side adjustments (2 each side) using 1\" webbing and ladder locks. Shoulder adjustments using 2\" webbing and hook & loop fastener. Radio pouch for small, tactical radio at upper left front shoulder. All pockets feature grommet-reinforced drain holes. Robust drag handle on back behind neck. Pouch (vertical on back) for hydration bladder. Horizontal radio pouch on back (above hydration bladder pouch). Molded Kydex holster with thumb brake. (M9) Right Hand. Belt loops (1\" webbing with hook & loop and snap closure) around bottom for securing to belt. Two flat pockets on inside of front panels (left and right). Foam removal facilitated by use of zippered pockets. 1000 denier Dupont Cordura, coated on back, 1 1/2 oz. polyurethane outer liner. U.S. Coast Guard approved closed cell foam for buoyancy. All zippers and sliders are non-corrosive polymeric material.